1. 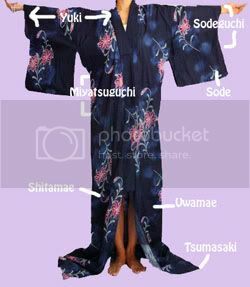 Before you wear a Yukata, let's be familiar with the Yukata parts !! 2. 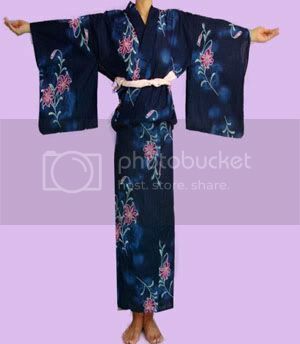 When you wear a Yukata, long sleeves will be always on your way. 3. So.... let's flip both sides of the sleeves to the back. 4. Bring up both sides of Tomoeri in front of you in the center. 5. 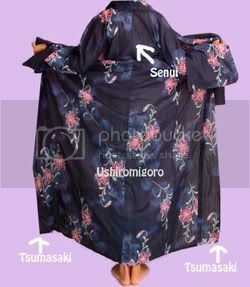 While one hand is holding both Tomoeri, use the other hand to pull down the Senui in the back. ** Adjust Senui to the center. ** Adjust how much neck area you want to show. A fist size space is recommended. 6. Hold the Tomoeri in each hands. 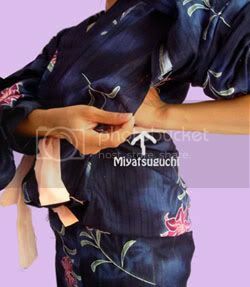 While try to keep the top half stable, open the arms and bring up the bottom of the Yukata. 7. 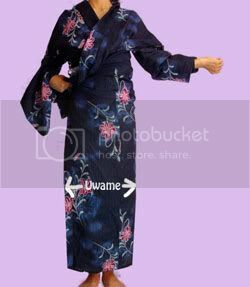 Bring Uwamae (the left side) to the front and determine the length. ** Your ankles should be covered. ** Okumisen (first vertical sawing line from the side edge) should be on the same line as your right pinky toe. ** Pull all the extra fabric to the far right. 8. 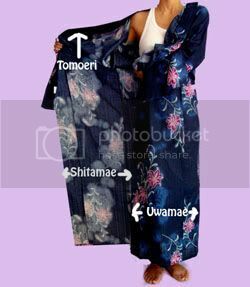 Open up Uwamae( the left side) and bring Shitamae ( right side) to the front. 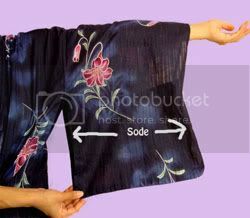 ** Adjust the length and tightly wrap around your body. ** Shitamae's Tsumasaki is nice to be about 4" above the ground. 9. 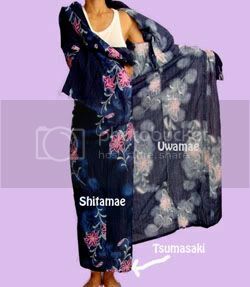 Bring Uwamae ( left side) over the right. ** Uwamae Tsumasaki is nice to be about 2" above the ground. 10. 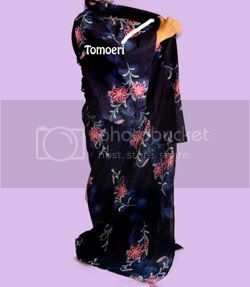 While holding the Tomoeri by the right waist, wrap your Yukata using a Koshihimo to stabilize. ** Do not tie the koshihimo too loose. This will cause the Yukata to slide around. ** Tack the koshihimo ends in to avid the tail to show up underneath Ohashori. 11. 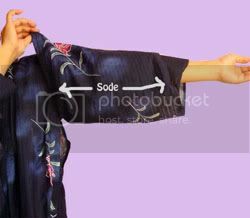 Put your both arms from Miyatsuguchi (side open area) to the front. 12. 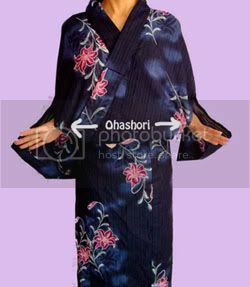 Pull down the extra fabric over koshihimo to create "Ohashori". ** Make sure Ohashori bottom is Horizontal. ** Make sure collar location is still the same. 13. 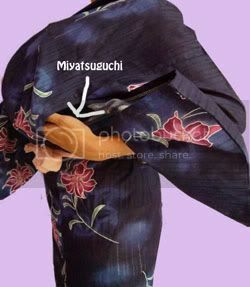 Put your hands from the Miyatsuguchi and pull down the extra fabric. ** Also pull it down from outside to make sure Ohashori back is clean and neat. ** Check if the Senui is still in the center. 14. 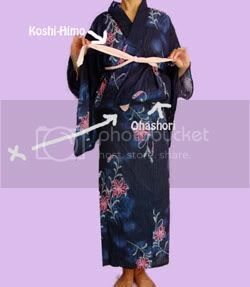 After Ohashori is made, tie right below the bust using a koshihimo or datejime. 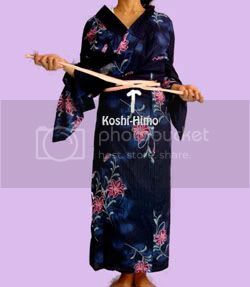 ** Make sure to tack the koshihimo in so the tail will not show underneath the Obi. 15. If you are slim build, there might be extra fabric all around the top. Bring all the extra fabric from the back to the sides and push it under the front fabric and hide it. This small technique will make a clean look from the side! 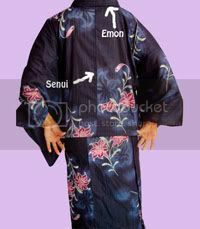 ** Depending on your body type, Senui below the Ohashori in the back may not be in the center. Do not worry ! ** Make sure your Senui line in the back above Ohashori is in the center. 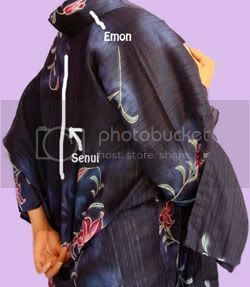 ** Make sure your left side Okumisen is lined in the front (it should be connected top to bottom). You are half way done. If you just put an Obi, you are ready to go out! !